President Donald Trump speaks from the Oval Office of the White House as he gives a prime-time address about border security on Jan. 8, 2018. WASHINGTON – President Donald Trump has run into a wall. It’s the new Democratic House. Trump has always been most comfortable speaking at unscripted campaign-style rallies where he draws from the energy of a raucous crowd. This time, sitting at the historic Resolute desk and reading from a teleprompter, he was somber and a little stiff at first, then spoke in darker and more emotional tones, though he didn’t deliver on his threat to declare the situation at the southern border a national emergency. The president’s unyielding demand for funds to build a wall, the signature promise of his 2016 presidential campaign, has smashed into the flat rejection of that idea by congressional Democrats. That battle, the knot at the center of the partial government shutdown, looms as the first test of wills in the nation’s new divided government. Both sides tried to convince voters that they were the reasonable ones and the other side the obstructionists, though neither volunteered the sort of gesture that might clear a path toward a compromise. Congressional Republicans also hadn’t delivered money for Trump’s wall when they were in charge over the past two years, and the shutdown began on their watch. But they didn’t openly defy him on that issue, or most others. In the survey, conducted Jan. 1-7, a 51 percent majority said the president “deserves most of the blame” for the shutdown, up four percentage points from two weeks earlier. About a third, 32 percent, blame congressional Democrats. Left unmentioned on Tuesday night were dramatic news developments during the hours leading up to Trump’s speech that were a reminder that the shutdown and the wall aren’t the only crises brewing for the White House, and perhaps not even the most serious ones. First, Natalia Veselnitskaya, the Russian lawyer who held a controversial meeting with Trump campaign officials at Trump Tower in June 2016, was charged with obstruction of justice in a separate case that demonstrated her close ties with the Kremlin. Then, a court filing that was unsealed Tuesday inadvertently disclosed that Paul Manafort, at one time Trump’s campaign manager, shared campaign polling with an associate with ties to Russian intelligence. Both stories underscore the possibility of collusion between the Trump campaign and Moscow, something Trump has repeatedly and vehemently denied. “The only solution is for Democrats to pass the spending bill that defends our borders and reopens the government,” Trump declared, calling the two issues inextricably linked. Schumer demanded that they be untied. “Mr. President, reopen the government and we can work to resolve our differences over border security,” he said. 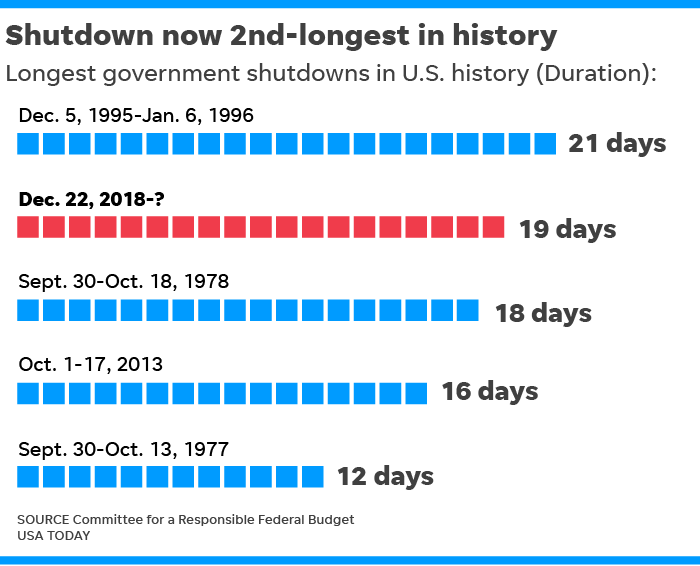 Just after midnight Saturday, at Day 22, the shutdown would become be the longest in U.S. history. After Tuesday’s standoff, setting that new record seemed to be a safe bet.